PepsiCo India has won the title sponsorship rights of the Indian Premier League (IPL) Twenty20 tournament from 2013 to 2017, with its bid of Rs 396.8 crore. Is it paying too much at a time when viewership of the tournament is declining? Real estate giant DLF Ltd, title sponsor from 2008 to 2012, had paid Rs 200 crore. "It is not at all a high price," says Deepika Warrier, Executive Director-Marketing, PepsiCo India. "A lot of deliberation went into this investment. No association with cricket is complete without a strong association with IPL. Our estimate is that we will get five to six times the value of the money we paid." Dogged by scandals, especially those surrounding its first chairman Lalit Modi, IPL's brand value has fallen from $4.1 billion in 2010 to $2.9 billion in 2012, according to Brand Finance, a firm specialising in brand valuations. 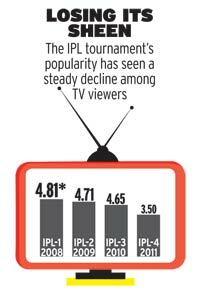 "The brand of IPL is on a decline. It is almost touching its base value of 2008," says Unni Krishnan, Managing Director, Brand Finance India. "IPL should not try to push issues like weaknesses in governance and financial instability under the carpet." But there are advantages for PepsiCo in the sponsorship as well. The tournament is held in summer, when sales of cold beverages peak. "April-May sales contribute almost 50 per cent of our annual beverage volume," says Warrier. The company could get access to star cricketers for promotions - depending on the fine print of the deal - while main rival Coca Cola could be hindered from advertising at game venues. "Coke will be blown out from the scheme of things, because of the scale which Pepsi has now with IPL," says IPL's CEO Sundar Raman. Neeraj Vyas, Executive Vice President and Business Head of TV channels SET Max and Sony Mix is also gung ho. SET Max has been IPL's broadcaster since the tournament started in 2008, though from next year Sony Mix takes over. "TV ratings may show a decline, but the last rating of around 3.5 through 76 odd matches is still an achievement," he says. IPL officials are naturally delighted. "Since, Pepsi is a global brand, IPL will have an international impact," says Rajeev Shukla, IPL Chairman.